CHICAGO – How many “Battlestar Galactica” fans don’t already have the excellent third season in some form? The release pattern of “BSG” on Blu-ray continues to surprise this critic as it feels like the niche market who doesn’t own the complete HD series or hasn’t already bought the standard DVD is very small, meaning that the question for most is going to be whether or not to upgrade. With that in mind, let’s focus on what’s new. Of course, the main draw is going to be the remastered video/audio and the episodes look and sound absolutely amazing. These are some of the best HD television sets on the market and it’s not like season three is going to break the pattern by sliding below the bar of the previous releases. If you only saw the show in standard definition, the HD upgrade is worth the price alone. As for new special features, there are a series of them that take advantage of Universal’s “U-Control” and “BD-Live” functionality. The “U-Control” features are “The Oracle” (an interactive guide including ships and characters) and “Battlestar Blips” (on-screen factoids). “BD-Live” functionality allows for more bonus content — “Battlestar Galactica Trivia Challenge,” and “Battlestar Galactica: Ultimate Battle Card Game,” an interactive feature in which you can challenge your buddies, as Colonials or Cylons, in the ultimate battle of strategy. Battlestar Galactica: Season Three was released on Blu-ray on July 27th, 2010. We’re ALMOST there. The only season unavailable on Blu-ray right now is the first half of season four. Of course, that’s almost more ridiculous that there’s still one missing but at least we can see the finish line. “Battlestar Galactica” is one of the best shows of new millennium and this science fiction fan is worried that the foundation for intellectual genre writing has been supplanted on the SyFy network with silly TV movies and weak original programming. 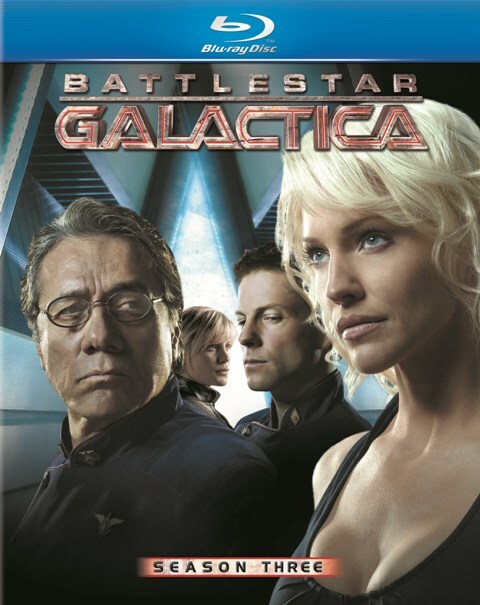 I thought that “BSG” would be one of the more influential shows of the ’00s but it’s starting to look like it was the anomaly, a show too good to copy. ‘Battlestar Galactica: Season Three’ is released by Universal Home Video and stars Edward James Olmos, Mary McDonalle, Katee Sackhoff, Jamie Bamber, James Callis, Tricia Helfer, and Grace Park, and was created by Ronald D. Moore and David Eick. The Blu-Ray was released on July 27th, 2010. It is not rated.